Rear Disc Brake kits with E-Brakes should be the first thing you consider when you are wanting to update your cars brake system. 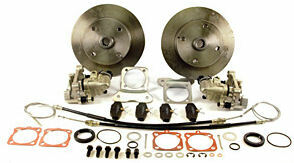 These kits are designed for street car applications. Fits 4/130 VW, 5/130 Porsche, 5 on 4 3/4 Chevy & Blank Rotor kits. Does not work with 14" wheels. Kit comes complete as seen. Click Options tab to choose yours.